This article explains how to use Microsoft Outlook to recover an item that was deleted from an Exchange mailbox. All folders are recoverable even when the item has been removed from the deleted items folder if they were deleted within the last 28 days. However items that were deleted while holding down the 'Shift' key and that were never moved to the 'Deleted Items' folder will not be recoverable using this method and will require a chargeable restore. For the purpose of this article we will use the five example emails in the inbox as shown below. Once deleted these items then go to the deleted items folder. The emails are then deleted from the deleted items folder. Now to recover these emails we will need to select the inbox as shown below. 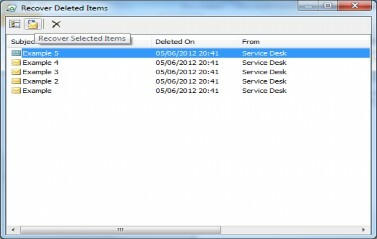 Selecting the deleted items icon will present you with the below window containing items that have been deleted from deleted items within the last 28 days. By selecting the items within this window you will be able to then select the recover selected items button as shown in the screenshot above. These recovered items will be sent back to the original folder they have been deleted from.